4 Comments Published by Cedric Benetti on Saturday, July 25, 2009 at 7/25/2009 02:31:00 AM. 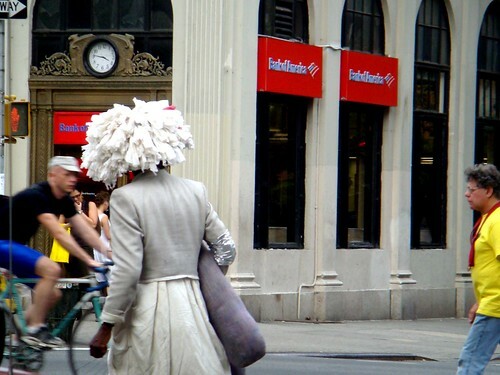 This is New York the way we love it: crazy people and shouting weirdness. What could this big red van be hiding behind itself on this busy intersection? 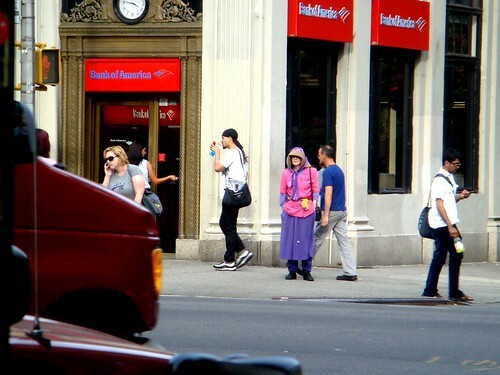 Ah yes, it is the creepy old lady dressed in a hoodie, standing there for ten minutes observing you. Then she reaches into her backpack and pulls out a kitty and throws it at you while she shouts drunken people stuff such as "lawnmoaer" and "kittens". But then the scene gets suddenly interrupted by a tall man wearing a dress and a wig obviously made of toiletpaper or used papernapkins. No one cares. Business as usual. This is New York. That NewYork and NewYorkers...Go figure!...Well, methinks! You left out the tourist wearing a fanny-pack who says something like, "Gee, Lurline. We don't see nothin' like that in Texas!"